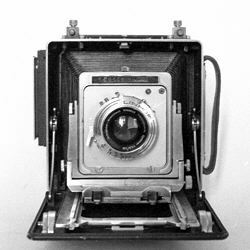 Before Large Format was called Large Format, Medium Format was called Small Format instead and 35mm was called Leica Format or Minature Format. So it's not like Large Format was called like that because of it's size but more because the smaller formats became popular. To get a feeling for the film sizes, take a look at the drawing below. Shown are the relative film sizes. 4 x 5" is on of the smallest sizes in the Large Format family which goes up to extremely large format. 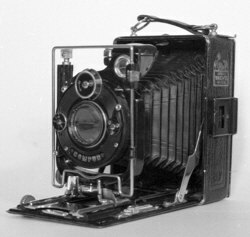 The first cameras used metal sheets which were photosensitised using liquid chemicals and then, still wet or dried, depending on the process, put in the camera to take a picture. The never process used glass plates with a photosensitive layer on one side. Because of the thickness of these glass plates, the light came through the photosensitive material, bounced partly off the pack of the glass or the back of the camera and reentered the photographic layer. This, amongst other things, caused the magic glow that old pictures got known for. This problem was solved by coating the back of the glass with dark "paint", thus preventing light to bounce back. Using glass has some drawbacks, it's heavy, it breakable and is expensive so film was invented. Newer large format cameras have a holder for cut film sheets. Usual sizes are 6 x 9 (centimeters), 4 x 5 inches or 13 x 18 centimeters. These sheets are put in light tight sheet film holders, which ofter are two sided, one sheet on each side. These sheets have to be put in the holders in total darkness so you actually need a dark room or a changing bag for this. They're big, they're black and they're entirely obsolete but that makes them great! Glass plates are actually still being produced for scientific reasons where absolute flatness of the negative is a must. But there is a work-around so that you can really use these old beauties: buy a roll film adapter and use them with still widely available 120 roll film. The only drawback is that these backs don't come very cheap and the camera is a lot more bulky than native folding roll film cameras. So the obvious choice is to look for a camera that uses sheet film. Sheet film, although harder to get nowadays and in less flavours than before, is still being produced. Large format cameras can also be bought cheaply now with all professionals moving to digital so now is the time to get your system. That way you also help keeping the format alive! Surely a lot of work but the resulting negatives or slides are very rewarding. The detail, the quality! Which type of camera to buy? There are different camera types you can use. Easiest for travel / hiking is a press camera. They're not too heavy, fold to a small package and they have limited camera movements. The Busch Pressman is perfect for that, it's a press camera but has many movements, horizontal and vertical shift, front tilt up and down and my modified camera also has back up and down shifts. For studio work a monorail is easiest to use. Full movements, great flexibility and an "everything goes" kind of design. For field work they are not so much recommended as it takes a long time to build and calibrate. But of course one can basically use anything and there are people using a monorail in the field. But to help you make the right decision, check on of the links below. There are many well written "what to get" articles on the web. Everything you want to know about large format photography. The highly frequented LF forum on photo.net. Technical Books on Photography. Scheimpflug and Hinge explained. Large Format Information, Catalog Scans and Photographs.